From a standing position, place your hands on your hips, then root strongly into your left foot to create stability for your left ‘standing’ leg. Lift your right knee and place the sole of your right foot to the inside of your left calf or thigh, but avoid the knee area. Check that your right hip is ‘externally’ rotated, ie your right knee is pointing out to the side. Your left and right hip bones should both be facing forward and level (watch how your left hip wants to sink when you lift your right leg!). See if you can bring your hands into prayer position in front of your chest, and… if you’re still steady, then stretch your arms slowly overhead. Try to relax the muscles in your face and stare at a steady point in front of you. To come out of Tree Pose, slowly release your right foot and gently bring it to the ground. When you’re ready, do the pose on the other side. Tree Pose is preceded and followed by ‘Tadasana’, the standing pose. This is a pose that often needs years of practice and oodles of patience, and it can feel so frustrating if you keep ‘falling’. But yoga teaches us to be patient, so how we respond to this frustration can also be a lesson to us! ‘Practise and all is coming’ is a famous quote from Ashtanga Yoga guru Patthabi Jois. If it’s too difficult to start, then practice keeping the ball of your elevated foot on the floor. Try to gaze at a fixed (unmoving) point. This is tricky if you have other wobbling yogis in front of you in class, admittedly, so it may help to start to practise facing a blank wall – just a couple of feet away from it. This will remove peripheral distractions and should allow you to stay steadier for longer. You can then gradually increase the distance from the wall as your balance improves. Try to maintain a calm, steady and even breath. If your mind is focussing on your breath it will be less distracted by external factors, which should keep your body steadier as well. If your foot is on your thigh, you can create a greater sense of stability by pressing your foot into your thigh and your thigh into your foot. 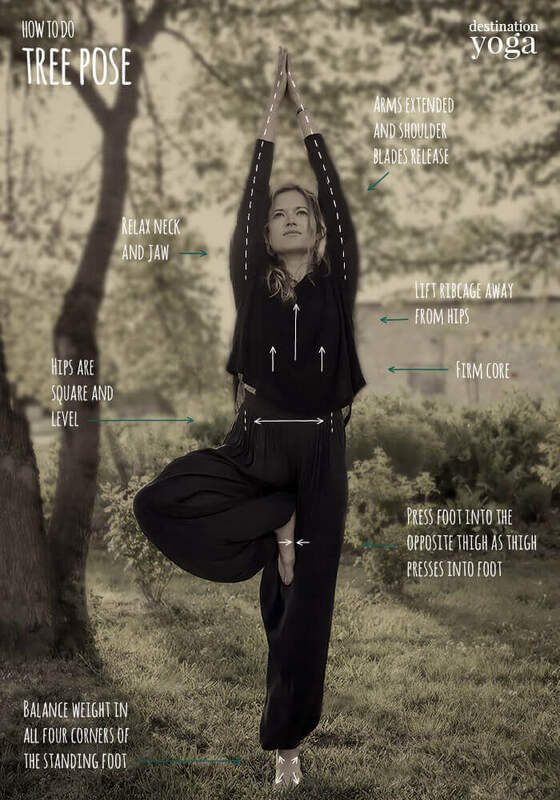 Once you have mastered the pose and can stand comfortably for ten breaths or so, try to slowly flicker your eyes closed and see what happens to your balance! Tree Pose is great for strengthening the standing leg and also for releasing the muscles of the intter thigh of the lifted leg. It is superb for improving balance and practising mental focus. Avoid Tree Pose if you have any hip or knee injury, or if you have difficulty standing.